There are two priorities that are built into the very mission of my blog – supporting other moms and building sisterhood. We lift as we climb around these parts, so of course I’m going to key you in to the little blogging and social media hacks I learn along the way, starting with none other than Facebook. The platform is a great way to reach people, so I’m actively engaged in several blogging and mommy Facebook groups. Now when I say actively engaged, I don’t just mean dropping links to promote my own work. Although I do post links in my groups, I make it a point to also support other writers by sharing their work and answering their juicy questions. Well, the Facebook algorithm makes it quite difficult to do this, deleting any comments with links once you’ve hit its threshold. It’s beyond irritating. I could see if I were breaking group policies, but many of the groups I’m in ask you to drop links on specific days. I’m no techie, not by a long shot, but I’ve picked up a few workarounds just by doing what I do on a daily basis. My workarounds are about tricking the Facebook algorithm that deletes your comments under other people’s posts. 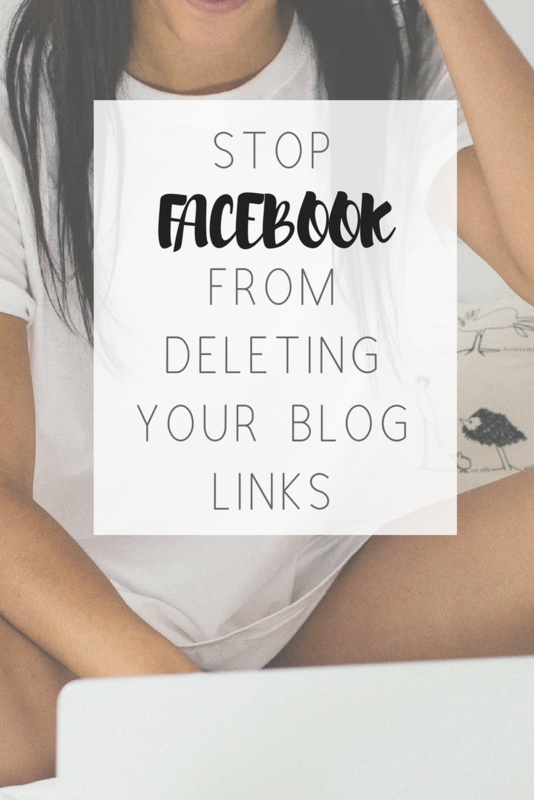 But the best way to make sure your links aren’t deleted is to post them on your own pages once a day or in original posts in Facebook groups. Just be careful not to break any of the group rules. You don’t want to actually be a spammer. Many group administrators on Facebook publish posts daily and invite bloggers to comment under them with links to promote their work. I would love to just drop my link and be done with it, but of course that would be too much like right. So I learned to slow down between posts. I comment without dropping links, let other bloggers know when I’ve shared their work and have a bit more fun with my Facebook groups in general. It helps me beat the algorithm, sure. But I also gain something from really engaging other women. That is the point after all. I’ve noticed that if someone likes your link or there is a comment under it, the post won’t be deleted. That includes when you comment under your own link and when someone posts a comment right after yours. The engagement seems to protect your comment from being deleted. Weird, right? (My technical analysis.) The trick is to comment under your link before you’ve reached the point where Facebook is automatically deleting every link you post. Then, it’s too late. Posting a space before the .com extension of your link helps to keep it live on Facebook. Just note: You won’t get that lovely link preview you’ve spent hours in the Facebook debugger trying to get to appear just the way you want. Also, newer bloggers may have no idea what you’re talking about. I used to skim the wordy requests and skip them all together. I’m a big believer in trying to work with businesses by bringing issues to their attention and giving them opportunities to fix them. It was just January that Facebook founder Mark Zuckerberg announced he would be focusing on enforcing the popular social media network’s policies and preventing misuses. So tell Facebook its “fixes” are also preventing people who aren’t spammers from sharing quality content. There’s a little question mark in the top right tab of your Facebook profile. Click “report a problem,” and actually report the problem. Yes, your comment could end up in the virtual circular file, but it doesn’t hurt to try. This isn’t comprehensive. It’s just what I picked up, so Please comment below with your own tips and Facebook hacks. This hasn’t happened to me in a long time. It was annoying from what I remember! Ooo you’ll have to share your magical tips for getting it to stop permanently! Once your account is flagged, there’s no good way to get it unflagged. Flagged accounts are limited to 2 links per hour, regardless of the URL source. My tip is to add some wording then edit the comment to add your link. Okay, the suggestion was actually given to me. It’s working so far. I haven’t experienced this. Does this happen when you post in multiple groups or something? This is insanely helpful! I have only had it happen once! This is good information. I love to read a good social media hack. Facebook’s algorithms can really effect the success of a blog post. Interesting! I’ve never had this happen to me but always wondered why peoples links were being deleted. Oh wow I had no clue Facebook was doing this. But then again I freely admit Facebook is my least favorite Social media platform so I don’t frequent it as often as I should as a blogger. This will come in handy thanks! These are good tips. I’ve hear a lot of folks complaining about deleted links in various groups. I will share these and use them when I have an issue. I’ve had to change my password over 30 times in the last 4 months. Posting sparingly only works sometimes. I wish they would fix this issue. I really need Facebook to just let people use the platform without all this drama. But in everything it is pay to play and I am sure once people pay then FB leaves them alone. I had no clue that FB deleted links after a while! I like FB for blog traffic but I must admit that it drives me crazy sometimes with all the extraness! Wow! Great tips as I have never experienced this before. Why does Facebook have to be so complicated behind the scenes? I guess facebook is like instagram algorithm this is hasnt happen to me so thanks for the tips. Hmm, this is interesting. I haven’t had Facebook delete any of my links. But, I definitely spread them out slowly. I didn’t realize this was an issue. I’ve never had a post deleted before – I don’t think so anyway. I have had my links deleted on so many occasions and seen lots of people complaining about this too, so these tips are so important. Thanks for sharing them. This is awesome advice. I haven’t had Facebook delete links on me, but should it happen, I am well prepared.